When the 1964 Pontiac GTO hit the market, Dodge was paying close attention, for it was not about to be left out of this new emerging muscle car market. Powerful V8 engines had been available since the 1950s in some Dodge cars, the legendary Hemi and Wedge based V8s had given Dodge customers plenty of punch. The difficulty Dodge had by the early 1960s was that it only had boring boxy car bodies to place these engines into. There was a reason Jan and Dean had a little old lady driving a super-stock Dodge in their 1964 "Little Old Lady from Pasadena" song since most Dodge cars at this time looked like old lady grocery getter cars. This would be a short-lived problem since Dodge for 1966 released the sporty 2-door Charger based on the 2-door Dodge Coronet platform (Chrysler B-body). The 1966 Charger had pleasant fastback lines that were easy on the eyes. Dodge for its effort was rewarded with 37,344 Charger sales for 1966. The same Charger body style carried over to the 1967 model year. By 1967 the muscle car competition was fierce, and Dodge felt the heat with Charger sales dipping to a paltry 15,788 units. Dodge was not one to throw in the towel, it came back harder against the competition for 1968. For 1968 Dodge came out with a new Charger body style that could be called nothing but a masterpiece. Its silhouette was perfect, every curve and edge on the car had purpose and meaning. 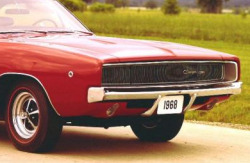 The full fastback roof of the Charger’s first two years had been changed in 1968 to a semi-fastback style that really completed the entire shape of the car. The styling alone of the 1968 Charger meant that this car would forever solidify Dodge as one of the big players in the muscle car golden era, and buyers lined up in droves to buy the 92,590 Chargers sold for the 1968 model year. The performance oriented R/T package (new on the Charger for 1968), ensured that performance buyers got a lot of punch under the hood to go with the great new styling. R/T was short for Road/Track, and it was intended to be the complete performance package for those who wanted to go fast. The R/T’s standard full length blacked out front grille was an updated version of the 1966 and 1967 Charger grille and added beautifully to its overall look. The headlights in the grille were hidden away from view by vacuum operated covers. And the R/T’s rear end with its small four round tail lights surrounded by a full rear length blacked out plate gave it a look of a stylish race car. Upon close inspection one could see a body integrated rear spoiler that obviously had its roots in Dodge’s racing involvement. The chrome gas tank cover also was racing inspired. The standard bumblebee stripe with the R/T package came in three different colors and was a first for Dodge which never offered a stripe package before 1968 on any of its cars. The stripe package on the 1968 Charger R/T was located on the rear portion of both rear quarter panels and connected to each other over the entire width of the trunk. For those who were not interested in the bumblebee stripe, Dodge did allow it to be deleted at no extra cost. The R/T had only two engines available in 1968 – the high performance 440 CID Magnum V8 and the 426 CID Hemi V8. The former of which was the standard V8 for the 1968 Charger R/T. For the 1968 model year 17,665 buyers bought Charger R/Ts most of these got this high performance 440 (Magnum) V8 that was rated at 375 horsepower. And 475 very lucky buyers got the NASCAR breed 426 Hemi V8 racing motor that made more horsepower than the 425 at 5000 rpm as advertised by Dodge. The Hemi also put out an amazing 490 lbs/ft of torque at 4000 rpm. Car and Driver magazine got a stock 426 Hemi powered 1968 Dodge Charger R/T through the 1/4 mile in an astounding 13.5 seconds at 105 mph and from 0-60 mph in 4.8 seconds. These figures today, 40 years later are still remarkable. The standard R/T motor the 440, though not as powerful as the Hemi was still one of the more powerful engines available in a muscle car for 1968. Anyone who has watched the greatest cinematic car chase of all time from the movie Bullitt (1968) which included a black 440 powered 1968 Charger R/T, can see that the 440 was no slacker – it could really burn up the pavement. Both the Hemi and the 440 were available with the TorqueFlite automatic transmission or the heavy-duty 4-speed manual transmission. As great as things got for the Charger R/T in 1968, there was one downside. Like most of the muscle cars of its day, the 1968 Charger R/T lagged behind when it came to braking. Power front disc brakes were a $54 option, which if ordered did help the braking situation but even with this option at higher speeds it did take a while to get to a complete stop. Power steering was a $73 option. And if you wanted a limited slip rear that also was optional but fortunately there were a few different ones to chose from. Luckily part of the R/T package was heavy-duty torsion bars, heavy-duty shocks, and a sway bar to help the R/T’s handling and cornering. And for 1968 the R/T’s standard F70x14 inch red line tires did also assist handling. Dodge advertised that for the 1968 Charger R/T there was "an extra leaf in the right rear spring to tame the torque". All in all the R/T was one of the best all around performance packages offered on any muscle car back in 1968. It showed the world that Dodge was a leader in the muscle car wars in 1968. Inside the Charger R/T’s cabin there was standard front bucket seats. The 1968 Charger instrument cluster and interior were very appealing and probably on their own sold a lot of Chargers. And with a laundry list of extra luxury and trims options, if a buyer went a little wild checking off the order sheet, the Charger inside looked more like a loaded upscale Chrysler than a muscle car. Some of these luxury options included a tilt and telescope steering wheel, power door locks, and cruise control. As the old saying goes – "when you got it, you got it". Back in 1968 Dodge with the Charger R/T – had it. The 1968 Charger R/T was probably one of the best cars ever produced by the Chrysler Corporation. It also put Dodge on a streak from 1968 to 1971 where it made some of the best muscle cars ever produced. Unfortunately by 1975 the steak was gone and the Charger name was put on a Chrysler Cordoba clone. It would only go downhill very fast from there. Only in the last few years with the introduction of the new 5.7 and 6.1 liter Hemi V8s along with its new wave of rear wheel drive cars has Chrysler begun to regain some of its lost glory. Back in 1968 in its advertising, Dodge called the 1968 Charger R/T – "the clean machine". Dodge should have called the 1968 Charger R/T – clean and mean, because that’s what it is.